The Northern Co-operative Meat Company is on a mission to modernise. Wiley's senior project manager Barry Murphy looks at its cold chain revamp. The Northern Co-operative Meat Company Ltd (NCMC) is a co-operatively owned service provider with a long tradition of maintaining and enhancing the manufacture, marketing and distribution of high-quality food products to the world. The Co-operative is recognised globally as a leader in red meat processing and is held in high esteem by its peers. NCMC recently underwent significant project upgrades across its business through a number of projects delivered by Wiley. The cold chain management system portion of the project has allowed the NCMC to manage cold chain requirements through best practice from the boning room to load-out. Cold chain management is a critical element of any food processing business. The sector is continually contending with additional challenges, from the variety of quality standards in various markets to continually increasing regulations. The cold chain is also facing many of the same matters that challenge the entire supply chain: serving a global market, being more strategic, driving out costs, and tackling capacity and resource constraints, all while managing the needs of the product. With that in mind, it’s no wonder NCMC placed an emphasis on its cold chain management system while completing major upgrades at their facility in Casino, NSW recently. The cold chain management system at NCMC comprises an automated storage and retrieval system, plate freezing capacity, blast chill tunnel and full ‘cold chain compliant’ loading dock facilities. Here we’ll focus on the automated storage and retrieval system (ASRS) and loading docks, as this is where the business gained added value. Due to the nature of the NCMC business, the company produces a large range of product and volumes. This has required a greater amount of product handling than is ideal in the past. The ASRS supplied by Dematic for installation into the facility designed by Wiley allows NCMC to better manage product flow by being able to place small order SKUs (those products that are less than a full pallet) in the storage facility and fill the pallet when sufficient numbers are produced, significantly reducing the amount of manual handling. This installation is the first ASRS in a frozen environment in Australia, and only the second in the world. The system is capable of handling more than 10,000 cartons per day. Cartons are stored in a single aisle of racks and retrieved using a shuttle system that largely reduces the need for forklifts and manual handling. The system was designed to allow for easy capacity expansion by the addition of further multishuttle racks. The ASRS, combined with the conveyors, allows NCMC meat processors to improve efficiencies in chilling and storage, reduce manual handling to improve worker WHS and extend shelf life of products. Another challenge on the NCMC project was achieving complete cold chain compliance in relation to the load-out. The challenge was combining the functionality of two distinct dock functions into one multi-use dock. The complying dock needed to service both semi-trailers and container trailers, a task that hadn’t been achieved anywhere else previously. Each loading dock has an ‘igloo’ that the truck reverses into, and a seal encloses the access point to the back of the truck – and now containers – to maintain full cold chain compliance. 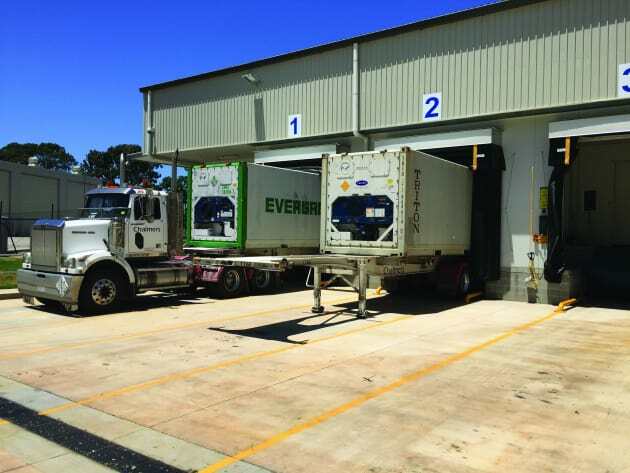 In a first for Australia, the loading dock system accommodates both shipping containers and pantech trucks (refrigerated trucks that have hard wall freight hulls) in a fully sealed, refrigerated environment. Each loading dock has an ‘igloo’ that the truck reverses into, and a seal encloses the access point to the back of the truck – and now containers – to maintain full cold chain compliance. This development, we believe, will soon become the norm for the industry. The technical difficulty arrived around the type of dock leveler utilised by each vehicle and arrangement of the ‘igloo’ (the building structure) around it. Usually, to use a container leveler with a semi-trailer, it does not drop low enough to allow the trailer doors to swing over it and is too wide to avoid clashing with the doors during its operation. In this scenario, a semi-trailer is required to open its doors prior to docking and controlling the temperature, hence the container leveler cannot achieve cold chain compliance. The solution for NCMC was to incorporate changes to the container leveler and igloo construction to achieve complete cold chain compliance. Wiley has finalised the distribution end of the business to provide NCMC with a complete upgrade that caters to its unique business model and provide opportunity for flexibility and growth. The NCMC continues to play a prominent part in developing improvements in the area of cold chain management. processes and facilities for safe, high quality food. Contact him on 1300 385 989 or connect@wiley.com.au.